Some of the greatest legends come from some of the most bizarre places and this one beats all. I have heard of the legend of a man so musically talented that with just one song, he could bring the music industry to its knees. When you hear of a story so great, one just has to seek the truth for herself. My quest takes me down in Louisiana, just off the west Pearl River, in a place called the Bayou. The only way you can get there is by boat, and you’d better know where to go because if you don’t, you just may find yourself lost. The area is beautiful with the tall bald cypress trees rising from the dark murky water. It’s as if Mother Nature lost the battle, the battle called control. There are no mowed and manicured lawns in the bayou, just various foliage that creates a world known only to a few. We leave the safety of the Pearl River and head down a small inlet. It’s early morn, but it feels like the end of the day as the Spanish moss hanging off the cypress trees provides cover from the bright sun light. As we travel further in, the world becomes quiet. Nonetheless, you can hear a splash or two as alligators make their way into the water. Out in the distance, I see the vibrant white of a ibis walking along a fallen tree. I’ve been told that there are vultures, hawks, and egrets; but we didn’t see any while we traveled the water ways. I am also warned about opossums, muskrats and armadillos too. The smell of the salty marsh air tickles the nose. Just as you get a good whiff of the delicate earthy aroma, it quickly turns to the stench of decay. The smell of dead wood, plants and dead fish are all part of the scent that is the bayou. Every once in a while, your nose is treated to the wonderful aroma of gumbo or jambalaya cooking on an outdoor fire next to a home. We pass inlet after inlet and I wonder if my guide really knows where he is going, or is he just speculating. There are no maps for the bayou and for me, it all seems like just a guessing game. After a bit or two, we take a left down a smaller inlet. Thirty minutes pass and it is in the silence that I hear the faint sounds of music. As we travel further in, the music gets louder and louder. I train my ears to try and pick up what instruments are playing. I can hear a guitar and perhaps the sound of a drum; but what I hear is something far more skilled than anything I have heard in my twenty-six years in the industry. The painful wailing cry of the guitar pierces my soul as if it was stabbed with a knife. I had never heard such pure raw emotions as I heard on this day. My guide begins to slow the boat down as I see what can only be described as a shack come into view. The tin roof looks like it had seen better days. The rest of the house was hidden among the fallen trees and various foliage, nonetheless, I could make out the simple A-frame structure. The boat came to a stop next to a small dock. Just off the dock was an outhouse, one that I hoped I would never have to use. As I proceeded down the path, the lower part of the shack came into view. Nailed above the porch was the skull of a long dead gator. A cast iron bath tub sat on the left side of the stoop and a clothes line hung from the nearest tree to one of the post holding the porch roof up. A metal cross was nailed upon the wooden door. Sitting upon a tree stump, near the front door, was a man. He was dressed in bib overalls with an old ball cap on. His eyes were hidden behind a pair of sunglasses. As my eyes adjusted, I could see that his once blond hair, now had streaks of gray. He ran his hand through his long white beard and he reminded me of Santa Claus with his paunchy belly. He just sat there with a guitar in his lap looking at me like I was from the IRS. I had been pre-warned that “bayou people don’t take to kindly to strangers.” Nevertheless, I had come to see the man behind the legend. “Are you Mr. Weevils, Beau Weevils?” I asked. With a gentle nod of his head and a smirk upon his face, he launched into a song on his guitar. From the first note from that first song all the way to the last note of the last song, he had me mesmerized to the point that I thought I was under some kind of Cajun Voodoo spell. Music is the catalyst for the mind, the heart, and the soul. When music is created accurately, it will generate an euphoria of emotions. These emotions will empower you to travel, within your mind’s eye, to places you have since forgotten and places you have never been. The new acquisition by Beau Weevils, does just that. 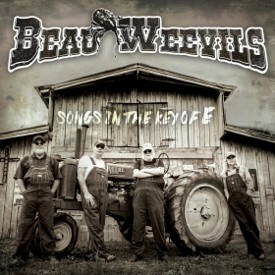 In 2018, Charlie Daniels teamed up with producer and drummer James Stroud, and guitarists Charlie Hayward and Billy Crain; to create an alter ego named Beau Weevils. It is through Beau Weevils that they released their project called Songs In The Key of E.
Would you like to continue reading this great article? This page requires you to log in to read. You may obtain a log in code with a paid subscription to Strictly Country. Or you can Advertise on this page to open it to the puplic!